Whole-Wheat Pita (Bread Revolution Series) – I'll Make It Myself! “Pita pockets” didn’t excite me as a kid. Toted as a kid-friendly food, the charm of stuffing sandwich fillings into a bread with a pocket was lost on me. I rediscovered pita–fresh pita–in university at Middle-Eastern diners and as (store-bought) hummus became more mainstream. 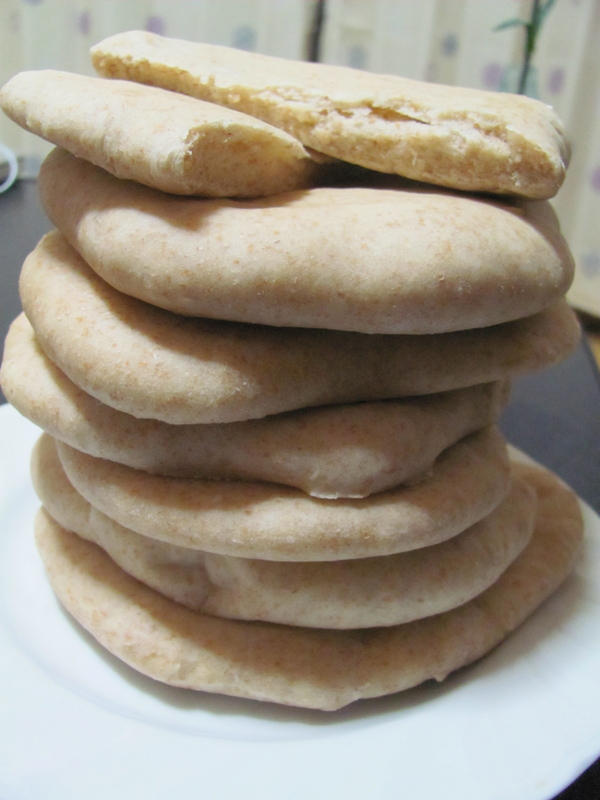 In Japan, I sometimes bought stacks of pita from the import store, but after preparing for an international cooking lesson, I discovered pita are really simple to make, and more importantly, make a great bread substitute for proper sandwiches in Japan. Save the trip to the import store for chickpeas–you don’t even need to make hummus to go with it! * I like to fill mine with avocado or homemade low-mayo tuna salad, beansprouts (the green kind), lettuce, tomato, and cucumber. You could also use leftover chicken breast, fish (deboned), cream cheese, grilled eggplants, or grilled firm tofu–just make sure the fillings aren’t too wet if you’re assembling the sandwich to be eaten later or you risk the thinner side of the pocket collapsing. You might be wondering about getting that perfectly puffed pita pocket. It requires no special equipment or magicking, but it does you 1. Follow the recipe exactly. I have tried to do this in a rush and cut down the amount of time for dough rising, and it does not work. You will get pocketless flatbread instead–it’ll be delicious but ultimately not what you were going for. 2. You need to bake the bread on hot metal. For the oven range, you have a couple options. Preheat the oven with the plate in it. I like to place a metal cookie sheet on top of the metal baking plate, but I’ve also had good luck with a cookie sheet on the ceramic rotating plate–as long as the bread is on hot metal, it’s happy. If you don’t have a cookie sheet, aluminum foil also works well. Parchment paper did not work for me. If you don’t have an oven, you can also do this in a frying pan. I’ve had no luck with that method yet, but some of my coworkers swear by it. If you don’t have whole-wheat flour at the ready, you can use an equal amount of white bread flour. I’ve had excellent luck with both versions. These are vegan if you use the sugar option rather than the honey. Yields 8 pitas. Serving size 1. 1. Activate the yeast by placing it with the honey/sugar in 300 mL of warm water until it dissolves. 2. Add flours, salt, and olive oil to the mixture and stiry until the dough forms a ball. Add extra 50 mL water as needed. 3. Place the dough on a clean work surface dusted in flour and knead for 10 minutes until the dough is elastic and smooth. Form dough into a ball. 4. Clean the bowl and coat in a little olive oil. Place dough in the bowl and cover with a clean damp towel or plastic wrap for 90 minutes or until it has doubled in size. 5. When the dough has risen, punch it down to release trapped gases and divide into 8 pieces. Roll each piece into a ball, cover with the towel or wrap, and let rest for 20 minutes. This is critical as it will let the dough relax so the pocket will form properly. 6. Preheat the oven range (if using one) to 205°C with the metal cooking plate/cookie sheets inside. 7. After the dough has relaxed, dust the work surface and a rolling pin with flour. Roll the pita to about 1.2 cm thick. If the dough doesn’t stretch, let it rest for 5-10 minutes more. 8. Remove the metal surface (cookie sheet, foil-covered baking tray) from the oven and place 1-2 pitas (or as many as will fit) on it. Cook for 3-10 minutes, until the dough puffs up. Cooking longer will result in crispier pita. I usually need about 5 minutes in my oven. OR you can cook in a hot nonstick frying pan until they puff up. 9. Enjoy immediately or let cool under a clean towel and wrap tightly to store. 10. To open the pocket, cut down the diameter with a sharp knife and gently open the pocket. Hummus is very easy to make at home with a good blender or food processor and dried chickpeas if you do acquire some–import stores and gourmet groceries usually have dried and sometimes have canned. Plus there are some more Japan-friendly hummus-related spreads that you can make, like baba ganoush, which is eggplant-based. Jackpot, I definitely want to try making these, I’ve looked everywhere for pitas, in foreign food stores in my town and in Nagoya, and I’ve never seen them. Except at the falafel place! I don’t have an oven though, just a little toaster oven, so I’ll have to use a frying pan. Do you (or your coworkers) have any tips for the frying pan method? Heat up one or more non-stick frying pans, over medium-high heat. You might be able to do it in a toaster oven if you can turn the heat up, though. I’ve done regular flatbread on the toaster mode of a smaller oven range. Pingback: Baba Ghanoush (Roasted Eggplant and Sesame Spread) | I'll Make It Myself!